Super-moon eclipse tetrad on Sukkot - a prophetic indicator? The scheduled appearance of four total lunar eclipses on major Jewish holidays between the start of Passover 2014 and September 27, 2015 (the start of Sukkot) has the attention of much of the religious world. Somewhat less common are tetrads – four consecutive total lunar eclipses with no intervening partial eclipses – which has occurred 62 times since the year 0 AD. A tetrad begins on Passover- a series of four total lunar eclipses that will occur over a period of about 18 months in 2014 and 2015 – each one on a Jewish festival day. Seven times in the past 2,000 years, a tetrad has coincided perfectly with Passover and Sukkot. The last of those tetrads began just prior to the outbreak of the Six Day War in 1967. Two others (in 1493 and 1949) began more than a year after the expulsion of the Jews from Spain and the State of Israel’s declaration of independence, respectively. Pastor Mark Biltz, author of the book, "Blood Moons: Decoding of the Imminent, Heavenly Signs," explained to JewTube why Israel and the gentile nations ought pay attention to those attempting to remove holy land from Jewish guardianship (such as activists and politicians advocating a sovereign Muslim state in Palestine) surrounding these eclipses (particularly during the super-moon - which will be visible in Israel during Sukkot, 2015) which he writes could be indicators of war against Israel. "These are patterns and historical facts that cannot be disregarded. The Jewish Talmud records that total lunar eclipses are indicators or omens for the nation of Israel.” See Blood Moons' special message to America in WND.com. 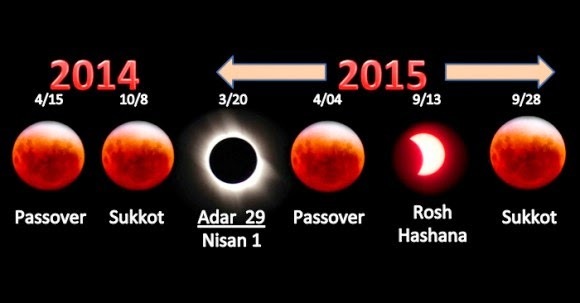 The eclipses are going to go almost totally unseen in Israel. Data published by NASA reveals that only the last of the four eclipses will be visible from the Middle East, and even the fourth will only be partially visible. What is the significance of the lulav and etrog which Jews pray holding inside the sukkah? In "Animal-activists confront orthodox Jewish sin-offering ritual - but lacking any Halal protests, how much is anti-Semitism?" JewTube showed our complete video of a leftist 2013 protest against kaparos/kaparot in Los Angeles. This condensed version shows the counter-protestors, led by Rabbi Moshe Parry, challenging the protestors, led by progressive activists Rabbi Jonathan Klein, executive director at the progressive advocacy group CLUE-LA (Clergy & Laity United for Economic Justice) and Iranian-Muslim-born, Ms. Niloo Khodadadeh. Rabbi Parry argues that their conduct reveals a number of the activists to be hateful of Jews. 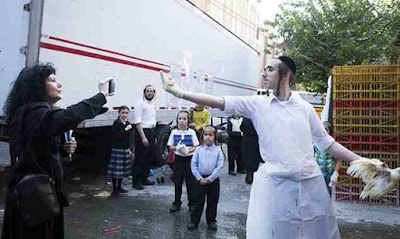 The movement discriminates by protesting solely against Jews- who conduct this kosher ritual only one week a year, and disregard the more inhumane Halal slaughter which is conducted 52-weeks per year. Rabbi Parry calls for Jews to develop physical vigilance to deter future anti-Jewish protests and confrontations. In the Jewish Journal, (The battle over kapparot goest to court, Sept 8) writer Edmon Rodman reports that on Aug. 26, a group of attorneys (led by David Simon) representing seven plaintiffs seeking to stop public kapparot ceremonies in Los Angeles filed suit in Los Angeles County Superior Court. When asked whether he believes Jews are being singled out unfairly, especially by animal rights activists, Simon said he has seen “some evidence” of this. For some “fringe people,” there “may be some anti-Semitic component to their perspective on this,” he said. Recently in Williamsburg, Brooklyn a Hasid 'flipped-off' a protestor photographing him performing kaparos. Jay Michaelson took-up his cause in The Forward "Why This Hasid WAS RIGHT to Flip the Bird to Kaparot Protestor"
I can imagine it (kaparot) being more cathartic – and thus more worthwhile – than most Yom Kippur services that will be held later this week. ... So why are the protesters protesting? ... I can’t imagine any of the mostly-white English-speaking protesters standing outside carnicerias and protesting traditional Latin American methods of animal husbandry and slaughter. But the Jews – well, they’re just right. Easy to mock, yet safe to mock. Animal-activists confront orthodox Jewish sin-offering ritual - but lacking any Halal protests, how much is anti-Semitism? 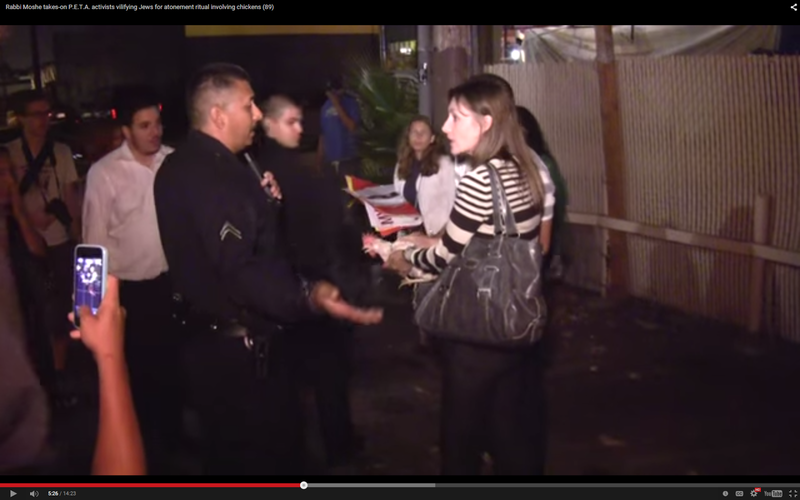 JooTube takes you inside the Yom Kippur protest which got California Department of Food and Agriculture to close-down the traditional atonement ritual in Los Angeles before Yom Kippur, 2013. The California Department of Food and Agriculture said Friday that it has ordered the shutdown of two Pico-Robertson operations that were participating in a traditional Orthodox Jewish ritual that involves the slaughtering of chickens. "I told them what they're doing is against state law," said Rhett Dunn, a Food and Agriculture investigator. "They have to be properly registered." Beit Aaron, a Sephardic Orthodox outreach organization, and Ohel Moshe, a synagogue, were performing the ritual -- known as kaparot (or kaparos)-- this week in the lead-up to Yom Kippur, the Jewish Day of Atonement. Beit Aaron's operation was in a makeshift tent behind a building it rents on Pico Boulevard. Ohel Moshe's practitioners were operating out of a temporary plywood structure in the synagogue's parking lot, also on Pico. The ancient ritual, practiced by a relatively small group of very observant Orthodox Jews, aims to provide believers an opportunity to atone for their sins. A practitioner holds a chicken under the wings and circles it over the penitent's head or nearby, reciting an appropriate prayer. He then kills the chicken with a sharp blade and drains its blood. The chickens typically are then dressed and donated to charities such as the Midnight Mission. Organizer, Rabbi Jonathan Klein of Faith Action for Animals says that more than 100 people attended and that some stayed to demonstrate late into the night. Since the ceremony, activists including several staunch vegans and alarmed residents have taken to Pico Boulevard each evening, handing out fliers, setting up candlelight vigils and even bargaining with one kaparot manager to rescue chickens on the chopping block in exchange for protesting more peacefully. The demonstrations have sometimes gotten testy. Protesters and kaparot managers alike contend they've been peppered with anti-Semitic slurs. In one instance, police were called after a woman refused to exit a parking lot where she heard the screeching of fowl. By the time police arrived, she had walked down the block. No one was injured, and no arrests were made. Yom Kippur, the holiest day of the year for Jewish people, begins Friday evening and ends Saturday evening. 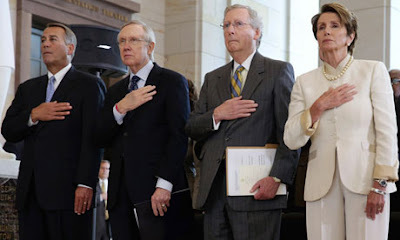 Senate Democrats on Thursday, Sept 10 used a procedural device to block a vote on a resolution disapproving the Iran nuclear agreement, saving President Obama the discomfiture of having to veto a measure of opposition to a signature foreign policy initiative. “Yes!,” came an exclamation as the number of votes to prevent the disapproval motion from moving forward reached the target of 41 required by Iran deal supporters. Sen. Dianne Feinstein (D-Calif.) punched the air with both fists in evident delight at the outcome. Sen. Lindsay Graham (R-SC) also lashed out at Democrats who support the JCPOA for claiming to be staunch supporters of Israel – whose government is vociferously opposed to the nuclear agreement. “If I hear one more comment from my Democratic friends about how much they love Israel – with friends like this, you don’t need an enemy,” he said, before quoting Iranian supreme leader Ayatollah Ali Khamenei in a speech Wednesday predicting that Israel would no longer exist in 25 years’ time. 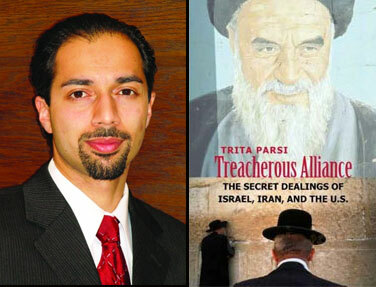 Obama's victory came from a combination of lobbying from the Jewish Left, heavy-handed Democrat party intimidation- which ZOA's Mort Klein calls "Chicago-mafia style tactics," and the National Iranian-American Council, The Shady Family Behind America’s Iran Lobby by Alex Shirazi in The Daily Beast 9/15 How one enterprising Iranian expat family and its allies successfully pushed for U.S.-Iran rapprochement—and now stands to make a fortune from sanctions relief. Zionist Organization of America's Mort Klein Calls Obama 'Sympathetic to Radical Islam' at anti-Iran Deal Rally in Washington, D.C.
Thousands of tea party activists turned-out Wednesday Sept 9 to see Donald Trump and Sen. Ted Cruz join forces against the Iran nuclear deal — cheering for the presidential rivals and seething at a deal that probably cannot be stopped. Congressman Brad Sherman (D- CA) delivered a speech concerning his opposition to the Joint Comprehensive Plan of Action on Iran’s nuclear program at 30 Years After on August 27th at the Writers Guild Theater in Beverly Hills and then answered audience questions. He spoke with us about the upstream lobbying to tow the Democrat Party line, backed by the Iran-lobby, the National Iranian-American Council ("NIAC") which receives support from the mullahs' regime, taking place on Capitol Hill. Here is a slightly-edited version of Rep. Sherman's address, which he also presented at Valley Beth Shalom in Encino, CA on a week prior. 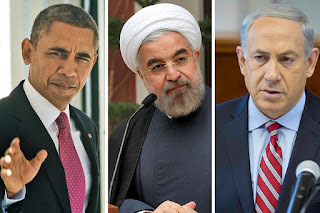 Now a little background about the Iran agreement, because without understanding the international finance, nuclear physics, constitutional and international law at play, the pieces don’t fit together. First, international finance: what are sanctions? People throw around sanctions as if it’s something we can turn up or turn down at will. And that’s true as to “primary sanctions.” Americans cannot buy any Iranian oil, and we haven’t since the mid-1990s. Unless you have an old Corvette, your car has never tasted Iranian oil. Those are primary sanctions. That’s not nearly enough. Sanctions are effective only when, through pressure and persuasion, we get European and Asian oil companies and banks to suspend their profitable business relationships with Iran. Now other countries can get a little insulted when the United States Congress tells their companies what to do. And presidents have been reluctant to go eyeball to eyeball and say “we’ll shut down ultimately the entire international finance system if your companies don’t do what we tell them to do.” So we haven’t really sanctioned major foreign oil companies who have done business with Iran. What we’ve done more recently is persuade and pressure countries around the world to forgo business with Iran (I will get to how we did that in a while). The bottom line is sanctions are useful only if Europe and Asia are participating. And it requires not only tough sanctions written by Congress, but good persuasion by President Obama and his team. They have done a better job than any of the prior administrations in persuading European and Asian governments to be on our side with this. And remember, no matter what Congress does, the Obama team will be telling European and Asian companies that now they should do business with Iran, subject to the deal. Nuclear physics. Three things you need to be a nuclear power: fissile material, weaponization, and a delivery system. The big one is fissile material. I’ll explain why. What is fissile material? You start with uranium ore, you go up to Yellowcake, you go to low enriched uranium by spinning centrifuges, which separate the uranium 235 from uranium 238 and other impurities, and you’ve got to get up to 3% or so to have fuel for a nuclear power plant; you’ve got to get up to 90% or more to have the components for a nuclear weapon. So people think they draw some solace from this saying “well, you go up to 3%, that’s a long way from 90%.” It doesn’t work that way. To get from natural uranium up to 3% is actually most of the effort. Going from 3 percent to 90 percent takes less time and effort than going from natural uranium to 3-5 percent, what is referred to as low enriched uranium suitable as fuel for a nuclear reactor. So what do we learn from this: a robust “peaceful” program gets you almost to nuclear weapons grade uranium. Weaponization is the process of taking that enriched uranium, building it into a ball, and having a system to implode it to bring it to critical mass. I’d like to think that we can stop weaponization, but Iran is already much of the way there. It is easier to do the weaponization piece than to get the fissile material, and weaponization research can be done in a much smaller facility and is much harder to catch. Weaponization will take a few additional months after Iran has the fissile material, but it is not the way to stop them from becoming a nuclear power. Finally, Iran wants intercontinental ballistic missiles. That is the symbol of being a great tyranny. But the fact is, you can smuggle a nuclear weapon inside a bale of marijuana. Iran will always have a nuclear delivery system, as long as there are a couple of guys who want 72 virgins apiece. So you’ve got to focus on the fissile material, and the discussion about centrifuges and stockpiles is about the fissile material, mostly enriched uranium and, to a lesser extent, plutonium, the other fissile material that can be used to create nuclear weapons. Now when we talk about the fissile material, it’s counter intuitive, but what you need for a robust peaceful electronic generation program is much larger than what you need for a weapons program. In fact, to electrify a city or two and have enough fuel to do so dwarfs the amount of fissile material you need for a robust nuclear bomb program. So if you allow Iran to have a complete and robust peaceful program, you’re allowing them to grow a forest. And where else would you hide a single tree? And the one tree in this example is enough fissile material for a nuclear weapon. Now as to law. Under U.S. law, the only thing that’s binding on the U.S. is a treaty that’s designed as a treaty, says its’ a treaty, is submitted to the Senate for ratification and gets a 2/3 positive vote. This Deal is not a treaty. It has no standing under U.S. law except as a handshake from our President. As a man of honor we’d expect him to follow it. What’s confusing is that much of the talk here is about whether there will be a 2/3 vote against the agreement to override a veto. And this confusion is our enemy; I’ll explain why in a bit. But the Deal is not going to get a 2/3 positive vote, the issue is whether it gets a 2/3 negative vote. But the issue is how do you explain to the general public that this Deal is not the same thing as a treaty? Especially if it gets a one-third positive vote; that sounds like the two-thirds vote needed to ratify a treaty. International law. The Vienna Convention of the Law of Treaties provides a hierarchy of agreements. This Deal is not a ratified treaty, it is not an unratified treaty, it is not an executive-legislative agreement; it is the lowest form of international handshake. But appearances matter. We are the good guys and we feel we must follow international law. You can be sure that Iran will violate this agreement, or not, based on whether it’s in its interest or whether they think they will get caught. No one around the Ayatollah will say “Oh, that would be in violation of international law.” But the good guys are constrained by international law. And if it appears in the mind of the publics in the United States and countries around the world that we are bound to this agreement, it will be more difficult for us to view ourselves as free to take action. Sam Yebri, President of 30 Years After, the Iranian Jewish-American civic group host of the event, addresses the community's perspectives on empowering and enriching the mullahs under the proposed inspections regimen. A view of the demonstrators from Ruptly's rip of RT's feed. ... The side deals are almost certainly a U.S. initiative to quietly drop the PMD issue by separating it from the nuclear agreement and placing it in a secret IAEA-Iran agreement that the American people and Congress cannot see. As such, the side deals violate the requirements of the Corker-Cardin bill (the Iran Nuclear Agreement Review Act), which requires that the administration provide to Congress all documents associated with the Iran nuclear agreement — including all side agreements. The secret side deals amount to national security fraud by the Obama administration. There are many reasons for members of Congress to vote against the Iran deal, but it's hard to see how anyone in Congress can vote for it in light of this deliberate attempt by the Obama administration to conceal from Congress its effort to drop a crucial benchmark needed to verify Iran's compliance with the agreement.